In the heyday of low-budget television and scrappy genre filmmaking, producers who needed a soundtrack for their commercial entertainments could reach for a selection of library music: LPs of stock recordings whose contents fit any mood required. Though at the time, the use of such records was mostly a cost-cutting manoeuvre for productions that couldn’t afford to hire their own composer, the industry soon took on its own life: library publishers became major financial successes, and much of the work they released was truly extraordinary. In fact, many of these anonymous or pseudonymous scores-on-demand were crafted by the some of the greatest musical minds of the late 20th century—expert musicians and innovative composers who revelled in the freedoms offered, paradoxically, by this most corporate of fields. 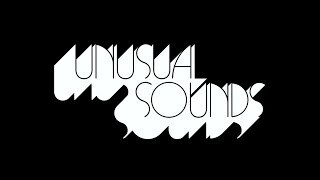 Unusual Sounds is a deep dive into a musical universe that has, until now, been accessible only to producers and record collectors; a celebration of this strange industry and an examination of its unique place at the nexus of art and commerce. The perfect companion to the David Hollander curated book Unusual Sounds: The Hidden History of Library Music (out now on Anthology Editions), these 20 tracks, encapsulate the niche and fascinating subculture of library music. Genres were spliced, conventions dispensed with, and oftentimes hybrid music of astonishing complexity was produced. Elements of rock, jazz, soul, even twentieth-century avant-garde composition were all utilized, and no stone was left unturned. As a result, some of the best library music defies all categorization, reflecting the individualistic quirks and artistry of the various musicians who made it. This compilation includes compositions by Brainticket founder Joel Vandroogenbroeck, KPM Allstars John Cameron and Keith Mansfield, Montenegrin-born composer Janko Nilović, and the Italian film composer Stefano Torossi amongst others. David Hollander is a producer, music supervisor, writer and collector living in Texas. A lifelong record collector, his library music collection is considered by many to be one of the finest of its kind in the world.